Named after the famous Lake Winnipesaukee. This blend isn’t just for the weekend. It has a very unique flavor medium body and lasting finish. - 16 Single Server Cups! I love a medium blend coffee in the morning. This was fantastic! Smooth flavor with no bitterness at all! I highly recommend it! Love love love this blend! This is a wonderful coffee, perfectly balanced, almost no bitterness. I am going to guess it's a medium roast. 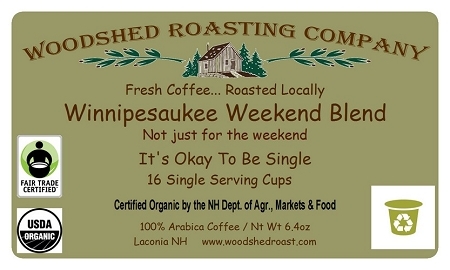 It is perfect to bring on a weekend visit because no matter what someone's preferences are, they WILL like this coffee. Great Blend not bitter I have a cup every morning for breakfast. Keep up the great work.